Australian Shepherd Dogs - The Australian Shepherd is a working dog that was developed in the United States in the 19th century. The dog, commonly known as an Aussie, is popular in its native California and is growing in popularity in countries across the world. Contrary to its name, the breed did not originate in Australia. 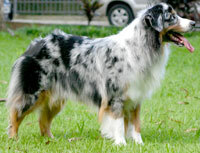 Like all working breeds, the Aussie has considerable energy and drive and usually needs a job to do. It often excels at dog sports such as frisbee and dog agility. This information is licensed under the GNU Free Documentation License. It uses material from the Australian Shepherd article on Wikipedia.org. 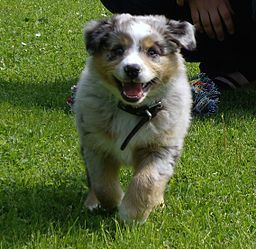 Australian Shepherd Breeders - Advertise your kennel puppies and dogs here.